​Welcome to my showcase/presentations page of my digital portfolio. Throughout my time in the MAET program at Michigan State I have focused on using technology to improve and enhance my teaching. This page showcases my work in various disciplines with the additive of technology as well as projects created by other educators with my support. ​If you're not using Twitter as a professional development tool you are missing out! This session will cover the ins and outs of getting started on this social media platform and how to get the most out of it. New and current users should make sure they are taking advantage of everything this incredible PLN tool has to offer. ​Explore how Google Maps, Earth, My Maps, and related resources can be utilized in your classroom within a variety of subjects to help achieve your lesson goals. ​Technology in education has increased the capability of teachers and students exponentially! One way of utilizing some of the amazing tech tools available is to Flip your classroom. This session will discuss the benefits and reasons you should flip your classroom and how it can be done with GSuite and helpful Chrome apps & extensions. ​Below you will find two presentations I gave at the EdTechTeam Summit in Breckenridge. ​I dove into the deep customization that can still be achieved with the old version of Google Forms including the use of themes, add-ons, page breaks, and advanced settings. ​Here's a grab and go session on some of my favorite Chrome apps and extensions that I found myself and other teachers using most often. 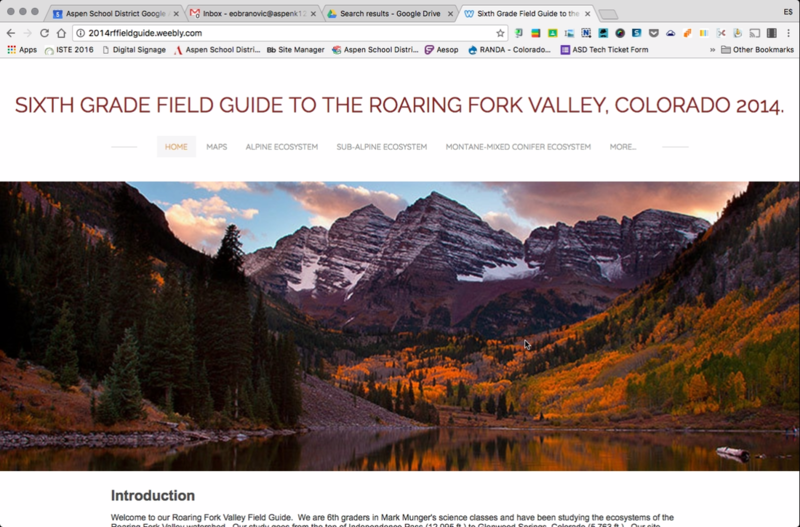 ​6th grade teacher, Mark Munger, wanted to transform a long-standing project in which students create a field guide for the Roaring Fork Valley that they could then reference for information regarding the various eco-systems contained within the valley. The end result was a great website created on Weebly that the students published and could later use to learn about eco-systems they didn't study and complete a final assessment on a Google Doc. A google site was created to give students instructions, responsibilities, and expectations for the project. In CEP 800 I looked to define how my students were learning a difficult concept like fractions and what I could do as a teacher to help them create a better understanding. The result was a digital story about the teaching and learning process that resulted in a fun culmination of what we had learned in digital media format. After completing my teaching and analysis of my students' struggles and understanding in learning fractions we took an internet sensation (The Harlem Shake) and put and educational twist on our own version for our final project in learning how to order fractions. CEP 812 had me look at how I plan to meet my goals in working through the MAET program and utilize technology to improve my craft. I created a Prezi to have a unique visual to layout my plan of action and how I hope to achieve everything I've set out to accomplish. One of my most challenging projects was identifying an area of need and trying to use technology as a viable solution. The problem I identified was the lack of time to teach Science in my curriculum and the way I proposed to solve that problem was create a WebQuest that my students could work on during our computer lab time using free online materials to meet the standards. The problem was broken into 5 parts which can be view on my blog by using the links below. There is also links to an implementation podcast and the actually WebQuest that is still used by my students. In CEP 820 I identified another area of need in my school's Social Studies curriculum. New standards has just been created and no new material was readily available to teach our students. 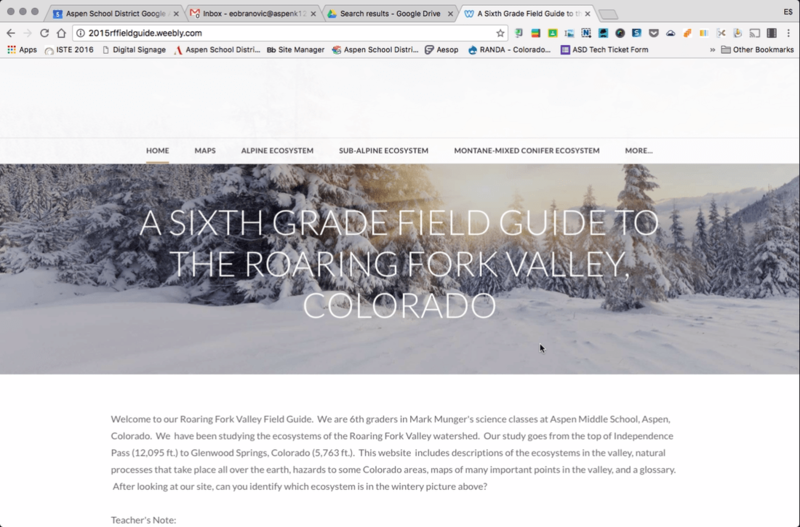 By exploring various types of CMS (Content Management Systems) I decided to use Haiku to create an online hybrid unit of our new Colorado History curriculum that can be utilized in and out of the classroom. As in my Wicked Problem Project I used any and all materials that I could access online and created a unit that meets my new standards while introducing students to a new way of learning.